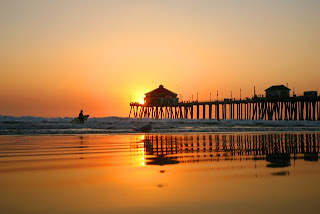 If you find yourself traveling through Orange County in the Summer, one place you should definitely visit is the Huntington Beach Surf City Nights. Actually, this special event takes place every Tuesday night 12 months out of the year from 5pm-9pm. Even though you can attend a Surf City night in the month of December, you will be able to experience California culture in it’s purest form if you can go to a Surf City night in the Summer. So, what makes Surf City Nights so special? Well, every Tuesday night the city of Huntington Beach closes down 4-5 blocks of Main St. to provide a festival or fair-like atmosphere for locals as well as tourists who come from around the world. As you walk along Main St. on a Surf City night, you will be able to see several different bands playing live music. It is possible to hear punk, jazz, reggae, and classic rock all on the same night! In addition to the cool music, Surf City nights will give you the opportunity to experience some amazing flavors of American street food. Make sure you arrive with an empty stomach because it will be hard to resist the flood of smells as you walk by street stands that are selling bacon-wrapped street dogs, mediterranean kabobs, carne asada fries, Baja-style fish tacos, Thai food, tamales, and much more! Oh yeah, and for dessert, there’s kettle corn, funnel cakes, and homemade churros. If all this sounds too unhealthy, you’re still in luck because Surf City Night is also a farmer’s market where you can but the freshest fruits, vegetables, juices, and smoothies. If you like shopping, then you will think you are in heaven! On Main St. you will find many cool surf shops where you can buy brands like Roxy, Hurley, Vans, Quicksilver, Ripcurl, and many more. On a Surf City Night you will also find street vendors selling hand-made arts and crafts, many of the art being related to California culture and history. When your feet start hurting and you need a break from walking along Main St., you can head to the beach and sit on the sand while you watch local surfers enjoy one of California’s most interesting sport – surfing! In the Summer, the sun sets around 7-8pm so you can also enjoy a beautiful sunset. If you can, try to make down to Huntington Beach on a Tuesday night. You will love it! I've been to HB on Tuesday nights and it is sooooo cool!! you should go!